What size Were Brooches in the Middle Ages – Part 6 – Buckles! Buckles. It seems an easy enough topic, but it turns out to be quite the pile of spaghetti. First of all, based on most of the buckles that I see at SCA events buckles were huge prior to 1600. But, based on the artifacts that I see in my collection, and museum collections, they were often quite moderate in size. Second, a buckle, is a buckle, is a buckle. Or is it? This picture shows just a few of the Medieval buckles in my collection. The buckle with the strange looking hook is called a locking buckle, and this particular one, along with the buckle in the top left corner are both from Northern Ireland. The other buckles are all from England. So let’s start with the simplest part – the size of buckles. It really isn’t a mystery. While buckles big enough to make a rodeo cowboy drool may look pretty cool, they really have very little to do with the buckles that were actually worn by most people prior to 1600. We have tons of buckles available for viewing on museum sites and lots of portraits of people wearing belts with buckles. Let’s look at an example. How about a family portrait of Archduke Maximilian II, painted in 1563? If anyone could afford a big fancy buckle, he sure could. But you won’t find one in this picture. This portrait of Queen Mary I, by Master John, shows the belts that were typical for women during this time frame. There is no real buckle, just some sort of fastener that allows the length of the belt to be adjusted. Well surely someone had big buckles before 1600! So I went to the Metropolitan Museum of Art and the British Museum online collections, and looked for the biggest buckles that I could find. This amazing Frankish buckle (675-725 AD) is 6 inches by 2 11/16 inches. Pretty respectable! And this Visigothic buckle (550-600 AD) is 5 3/8 by 2 3/8 inches. The first thing that I noticed when I started looking for big buckles was that large display type buckles were usually made up of several pieces. This Merovingian buckle is an excellent example. Each individual piece of the buckle is really not that huge, but the overall effect of the pieces when they are put together is pretty spectacular. The second thing that I noticed about larger display type buckles, is that even most of those were really not that wide (the top to bottom dimension on our giant Frankish buckle in the Met was less than 3 inches). Why do we see these limitations in size in pre-1600 buckles? Some of the obvious possibilities include cost, difficulty of construction. fashion, and functionality. And that is what we will talk about next time. 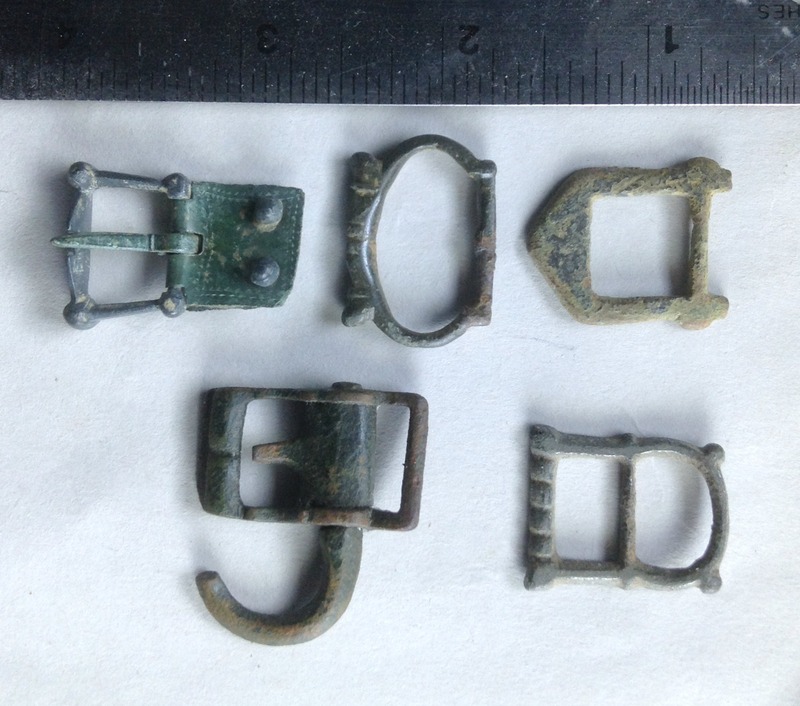 This entry was posted in Archaeological Finds, Buckles, Dress Accessories, Metal Casting, Metal Working and tagged buckles, Medieval buckles, Medieval dress accessories by Eirny. Bookmark the permalink.